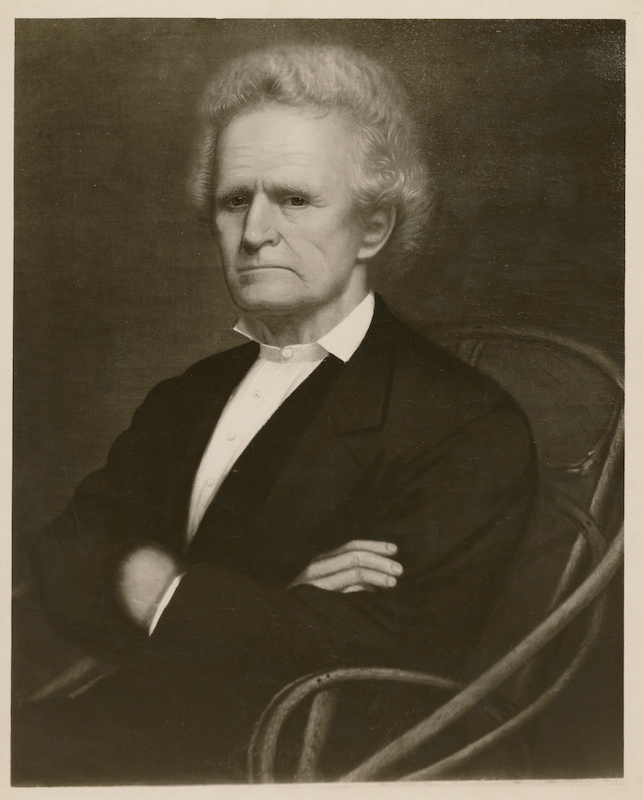 Springfield had more than its share of star lawyers – Abraham Lincoln, Stephen A. Douglas and others – in the 1830s and ‘40s. But everybody agreed the best trial lawyer on the circuit was a short, cranky Kentucky native named Stephen T. Logan. “In the fall of 1835 a young man fresh from the prim and dignified courts of New York arrived in Springfield,” H. Douglas Giger wrote in The Story of the Sangamon County Court House (1901). He wandered into the brick building standing in the center of the square and saw the judge on his bench with his chair tilted back, his heels higher than his head, a cob pipe in his mouth, his hair all awry, and before him stood a small dark man with long black hair pleading his case. Attentively listening sprawled a long, sombre (sic) form on the low platform used for the judge’s rostrum. The room was filled with men laughing and smoking. The judge was Stephen T. Logan, acknowledged to be the greatest lawyer Illinois has ever produced. The little man was Stephen A. Douglas, the “Little Giant,” and the form on the floor was that of Abraham Lincoln, destined in the years to come to be the two foremost characters in the most formidable crisis the Union ever knew. Logan “was recognized as the best all-round lawyer in Sangamon County, if not the State,” Lincoln biographer Benjamin Thomas wrote. Logan (1800-80) moved from Kentucky to Springfield in 1832. His talent was so evident that he was appointed a circuit judge only three years later (he resigned in 1837 because he could earn more money as a private attorney). Although by no means an adept politician (see below), Logan also served four terms in the Illinois General Assembly. Joseph Wallace described Logan’s courtroom approach in his 1904 history, Past and Present of the City of Springfield and Sangamon County, Illinois. Entertaining and instructive it was to observe him before a jury. Resting one foot upon a chair, he begins with a few commonplace remarks, uttered in a clear and conversational tone. He then takes up the leading facts and strong points of his case, dwells on them at length, and presents them from every standpoint favorable to his client. As he progresses, he warms to his work. His small frame assumes a more erect and impressive attitude; his gestures become more frequent; his shrill voice is pitched to a higher key; his gray eyes glow with animation; every muscle is at play and every energy of his nature is aroused, while words, arguments, illustrations, appeals flow in torrents from his lips. At the conclusion of his speech, he sinks into his seat in a profuse perspiration and well nigh exhausted. He leaves little else to be said on his side of the case, for he has covered the whole ground. Elihu Washburne, later a Congressman, saw Logan in action in the Illinois House in 1843. The fact that Logan asked Lincoln to become his partner in 1841 was a great compliment to Lincoln, but Logan had been keeping an eye on Lincoln for a decade. Perhaps the most famous case taken on by Logan and Lincoln involved a charge that two brothers had murdered an acquaintance and stolen his money. All of Springfield turned out to try, unsuccessfully, to find the body. But Logan, aided by Lincoln, convinced a judge to throw out the charges. Four days later, the supposed victim reappeared in Springfield, alive and unhurt. Despite his reputation, Logan didn’t win all his cases. Interstate Publishing Co.’s 1881 History of Sangamon County, Illinois, includes the story of a case in which Logan represented an elderly man accused of stealing some hogs. The prosecutor was Josiah Lamborn. Logan contended the man was too old to have committed the crime. The white-haired defendant, Logan said, had one foot in the grave and the other tottering on the brink. The Logan-Lincoln partnership was relatively brief – about three years – but both partners benefited. Lincoln got a sophisticated legal education, while he relieved Logan from having to travel from town to town on the Eighth Judicial Circuit. The firm of Logan and Lincoln moved into the Tinsley Building on the southwest corner of Fifth and Adams streets in 1843. Lincoln kept that location when they dissolved the partnership and Lincoln took on William Herndon as his junior partner. The site now is the Lincoln Law Offices State Historic Site. Neither the date nor the reason for the breakup of the Logan-Lincoln partnership is clear. Some historians believe Lincoln thought he wasn’t receiving his fair share of fees or that both were simply too ambitious to work together. Logan always said he merely wanted to bring his son David into the firm. The two remained friends and political allies. Logan nominated Lincoln as the Whig candidate for Congress in 1843, a race Logan also had contemplated entering. Logan also managed Lincoln’s unsuccessful campaign for a U.S. Senate seat in 1855 (seeing defeat in the offing, Lincoln – at Logan’s urging – finally threw his support to the eventual winner, Lyman Trumbull). He also was one of Lincoln’s managers at 1860 Republican convention that nominated Lincoln for president, although his influence there seems to have been minimal. Logan also contributed to a $5,000 fund that launched Lincoln’s candidacy. Lincoln, meanwhile, endorsed Logan for the Illinois Supreme Court in 1855. Logan lost badly – he was “worse beaten than any man ever was since elections were invented,” Lincoln wrote later. Unlike many of Lincoln’s Springfield compatriots, Logan didn’t seek a patronage office after Lincoln’s election, although he was named a delegate to an abortive peace conference held in Washington in early 1861. Lincoln also consulted Logan about the wording of his first inaugural address, but Lincoln ultimately turned down Logan’s recommendation that he revise wording Logan said would inflame the South. Logan largely retired from the law and public life in the 1860s, nearly two decades before his death. He is buried at Oak Ridge Cemetery. Hat tip: SangamonLink would like to acknowledge Mr. Lincoln and Friends, a web site sponsored by the Lehrman Institute, whose thoughtful analysis of Stephen T. Logan’s life and career contributed greatly to this entry. Citations for much of the information above are part of the Logan post at Mr. Lincoln and Friends. This entry was posted in Early residents, Historic Sites, Lincoln, Abraham, Politics, Prominent figures. Bookmark the permalink.